Will bummed me out this morning. He got up earlier than I did and saw our first robin in the tree in our backyard. But I one-upped him when I drove to town this morning to mail a bunch of seeds; I saw two robins just to the side of our driveway and three more, coming back from town. Then I saw a red-tailed hawk, American kestrel, and eight bald eagles, really close up, feeding on a road-killed deer. 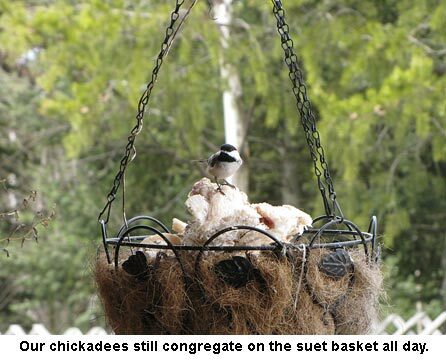 Of course, when I got home the chickadees were still gobbling up the suet in the basket on the front porch. Lots of wildlife this morning! 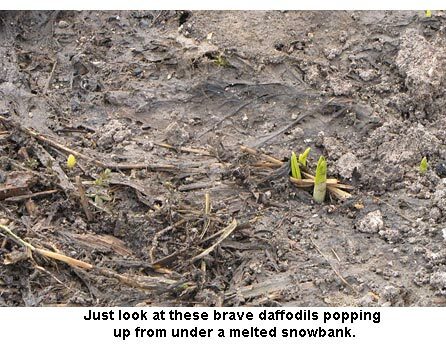 And, when I got out of the car, I took a peek at the daylily bed beside the driveway which had been buried under four feet of plowed snow all winter, not expecting to see anything. There were daffodil noses poking up three inches! How exciting! I’ve just got a couple more peppers to transplant and I’ll start on the first tomatoes. Those tomato seedlings are pretty leggy as they sprouted in a bag-covered flat much earlier than I’d expected. But I’ll just plant them deeper in the cups, covering most of the stem with potting soil. 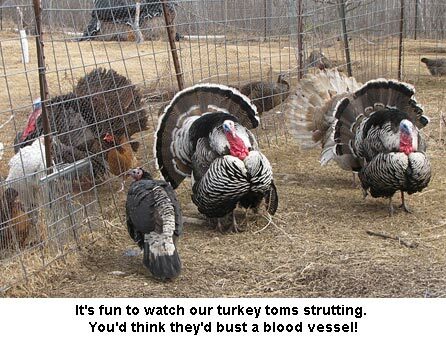 They’ll grow roots along the stem and will do fine regardless of their leggy start. Ha ha!! We’re still laughing. Actually ours is a dead skunk……. in West Virginia the second sign of spring is the robin. the first sign is the dead possum on the road. 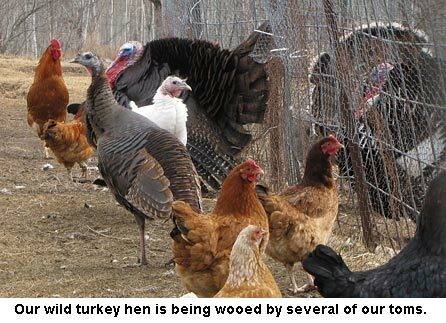 Miss Jackie, I am so excited to see mother wild turkey mingling among your turkey flock.